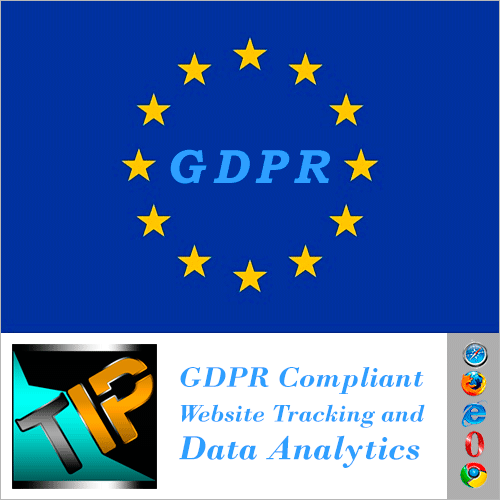 TraceMyIP is an inovator of the most comprehensive set of web publisher tools for complete and fully EU GDPR compliant website tracking, statistics and website analytics services. With General Data Protection Regulation in place, GDPR compliancy became of outmost importance for virtually every website publisher worldwide. GDPR was created to unify the data privacy laws across all European Union countries and came into effect on May 25 of 2018. Beginning from the date of this directive implementation, all website analytics and statistical data captured as a result of website tracking software utilization is bound to be regulated by the law. GDPR requires reinforcement of the website visitor privacy, protection of the acquired data and restriction of its usage. Without an appropriate set of tools that allow data capture and processing scalability per web publisher's requirements, achieving website visitor tracking compliancy can be difficult without investing a significant amount of time on research and the placement of law compliancy mechanisms. TraceMyIP delivers highly configurable GDPR compliance tools for website tracking and analytics that simplify the utilization of website visitor tracking software and save the precious web publishers time. Rather than spending the project development time on implementation of GDPR compliancy from ground up, with help of TraceMyIP web tracking software, web publishers can take advantage of their gained time. The time that's needed for content and service development to be in success. TraceMyIP simplifies the process of compliance implementation and helps overcome the legal challenges associated with EU GDPR directive. IP Address Masking allows you to anonymize computer IP addresses by setting last octet of IPv4 IPs or the last 80 bits of IPv6 IPs to zeros. Depending on your requirements, you can anonymize IPs before they're stored or after. Note that IP rules are applied before this option affects processing of an IP address. For EU GDPR compliance you may need to anonymize EU or ALL IPs (unless capturing and storing IPs is absolutely necessary for purposes such as legal investigation, transaction fraud prevention, etc.). Computer ID allows you to track specific computers regardless of an IP address and track IP address changes associated with a specific computer ID. For EU GDPR compliance, if the computer IDs on your logs are associated with personal information, you have an option to disable this feature completely. Computer ID Masking allows you to anonymize computer IDs by setting last two characters of a computer ID to zero. Although computer IDs are non-personally identifying unless associated with IPs or other personal data, you have an option to anonymize the IDs. IP GEO Location Precision adjusts how much GEO location information is displayed on your logs. For EU GDPR compliance, and depending on your website visitor privacy requirements, you may, for example, further increase your website visitors' privacy by disabling the city-level detection. IP Tracker Icons/widgets are the graphic trackers that are displayed on your website and are the functional part of TraceMyIP. If you have selected a Visitor Tracker style that displays IP address and other information, you may need to adjust this setting for EU GDPR compliance. Tracking Cookie Usage Scope options allows you to adjust the types of cookies used for generating your website statistics. This setting may need adjustment for EU GDPR compliance, although if you have enabled IP masking, the cookie usage changes its scope since the cookies no longer associate a visitor with a personally identifiable tokens such as an IP address. Browser Do-Not-Track (DNT) monitoring option enables TraceMyIP tracking implementation to monitor for [Do-Not-Track] setting in your website visitors' browsers. If a browser has [Do-Not-Track] option enabled, and this monitoring feature is enabled, TraceMyIP will stop tracking that particular browser. Data Retention Time enables you to automatically purge the real-time website visitors page loads data that is older than X-amount of time. In relation to EU GDPR compliance, you might be required to delete any personally identifiable data that is no longer needed. Therefore, this option allows you to delete the redundant records automatically. Note that this setting does not affect standard aggregated statistics such as number of hits over period of hours, days, months and years, and only deletes detailed pageload data, URLs and cumulative real-time stats. More options, more control over your data. Utilizing the above tools is also simplified with a dedicated GDPR compliance tool wizard. Simply select your type of web publishing and the system will automatically configure all of the above options. Gain the control of your time. Try TraceMyIP today!